A yummy gluten free chili recipe that makes just the right amount for two people. Whip it up and have it on the table in less than 35 minutes. It’s the perfect weeknight comfort food. Happy Fall, Ya’ll…It’s Chili Time! 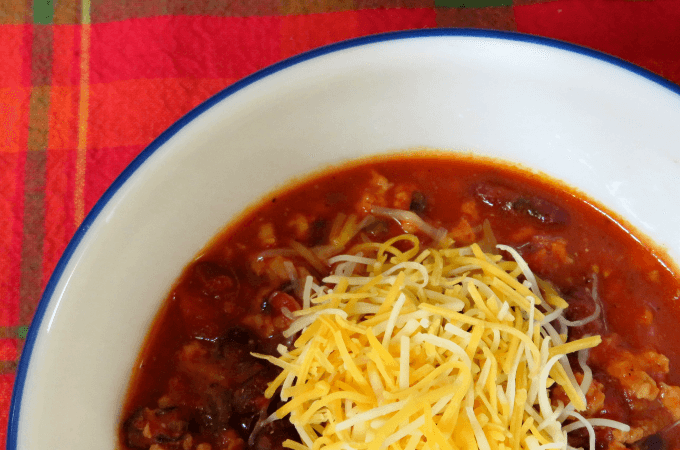 When the days get shorter and the temperature dips, around here that means chili weather. Now, I know you’re probably thinking, Julia, seriously, you’re in Florida. You don’t have Fall. Okay, so my Fall and your Fall are probably two totally different animals. But here in Florida, when it dips below 68, it’s Fall. And, to me, that means chili weather. Back in the day when I came home from school and saw that that pot of chili simmering on the back of the stove, I knew dinner was going to be awesome! Chili, shredded cheese, crackers…OMG. Best. Dinner. Ever. Navigating the comfort food waters can be tricky when you’re gluten intolerant. But my quick and easy chili is wheat free, fabulous, and the perfect small batch recipe for two. How Do You Make Gluten Free Chili? Going through Autumn without having chili for dinner at least two (or 10) times is a sin. Luckily, it’s easy to make chili gluten free, so I can easily meet my chili quota for the season. Many recipes add flour or masa to thicken chili. Instead, I don’t add as much liquid and keep everything chunky which makes this GF chili thick and hearty. Canned beans are almost always gluten free, (I use Bush’s) but, of course, always check your ingredients to be sure they’re certified gluten free. This will guarantee you your chili is wheatless. This recipe is perfect for two people. It makes about four bowls of chili, which means my husband gets his two bowls, and I get one for dinner and one for lunch the next day. This one pot dinner is very economical. I often buy ground pork because it’s cheaper than ground beef. It’s not as greasy, and now I actually prefer the taste of pork chili rather than beef. I make this recipe using a dutch oven, but it also cooks great in a crockpot. Just brown your meat and vegetables, throw it in the crockpot, and let it simmer all day. This hearty chili is a meal in itself, just pair it with southern style gluten free cornbread and finish it up with a moist and fluffy GF spice cupcake. 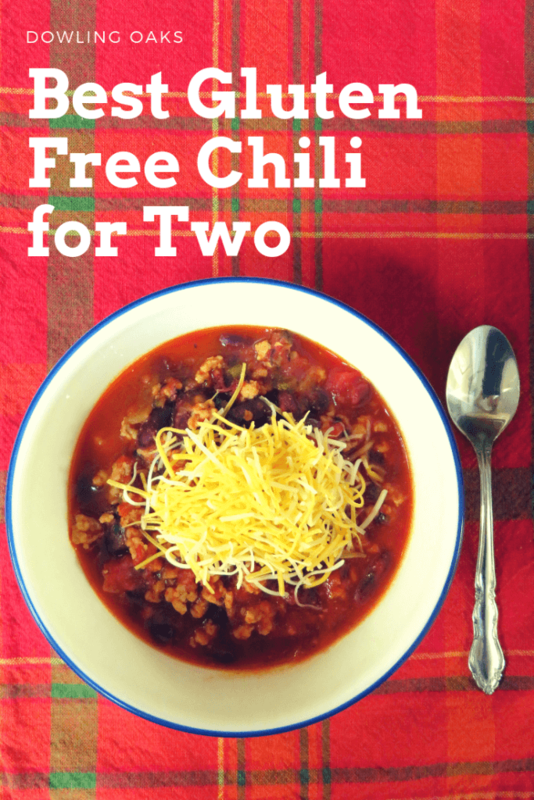 A yummy gluten free chili recipe that makes just the right amount for two people. Whip it up and have it on the table in less than 35 minutes. It's the perfect weeknight comfort food. Finely chop the onion and the seeded poblano pepper. Mince the garlic and rinse and drain the beans in a colander. Add the pork and seasonings to a large pan. Cook on medium heat until the meat is no longer pink. Drain any fat and transfer to a bowl. Add a bit of oil to the same pan and add the onions, poblano pepper, and garlic. Cook over medium heat. Cook until brown and softened. Add salt and pepper to taste. Add the cooked meat, chicken stock concentrate, beans, tomatoes and 1/2 cup of water to the pan. Bring to a boil, and then reduce heat and simmer for 20 minutes until thickened. Instead of simmering on the stove, I use a Lodge dutch oven as a slow cooker and cook in the oven at 250 F for 3-4 hours. Of course, you can also use a crockpot, too! Healthy gluten free chocolate chip cookies made from scratch. These easy gluten free cookies are soft, gooey, and made without xanthan gum. It’s truly the perfect GF chocolate chip cookie. I remember when I was little, my mother would bake cookies and treats for a week the first of December to box up and ship to my brother for Christmas. I loved being in the kitchen and helping her. I was small, so I don’t know how much help I really was (other than to eat the cookies!) but I think that’s when my love affair with cookies began. I’ve rarely met a cookie I didn’t like, but chocolate chip cookies are hands down my favorite. I’m kind of picky about them, though. I only like them if they’re soft and gooey. If they’re crunchy, I just won’t touch them. 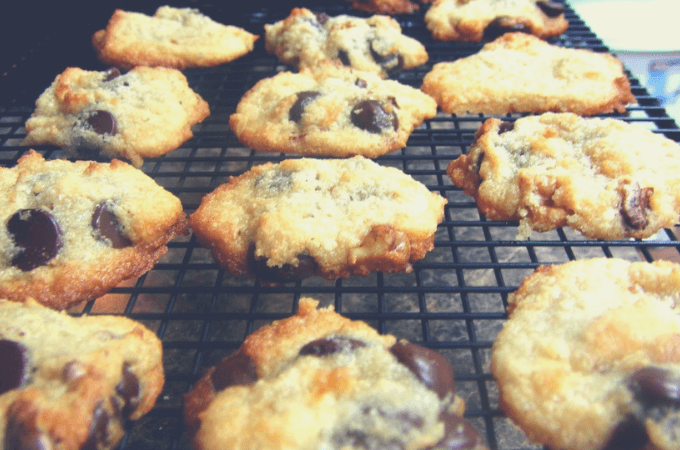 How Do you Make Gluten Free Chocolate Chip Cookies? So when I went gluten free and low carb, I was kind of bummed I had to give up cookies. I’d try a GF chocolate chip cookie recipe here and there, but they never did the trick for me. More often than not they were crunchy and crumbly. I wanted a chocolate chip cookie that was gluten free AND soft and gooey. I can’t remember where now, but a few years ago I came across a blog where they were discussing leaving eggs out of cookie recipes completely and using liquid to get a gooey texture. I had just started baking with xylitol honey , so I decided to do a little experimenting to see if I could come up with really good gluten free chocolate chip cookies from scratch. After a few batches, I nailed it. The result was an easy gluten free chocolate chip cookie recipe that met my soft and gooey standard. Before I found out I was gluten intolerant, I never really thought much about food allergies or special diets. I didn’t know anyone who had dietary requirements either, so it just wasn’t on my radar. Now I know how tough it is to watch other people eat good tasting treats and I’m stuck with the same old same old. And that stinks! Do not double this recipe! This recipe only makes a dozen cookies, and they don’t last long. I’ve tried to double it, but they turn out awful and I’m not sure why. This recipe only works with xylitol honey or xylitol maple syrup ! 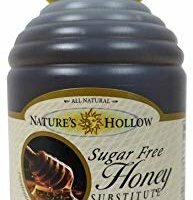 I thought I’d be smart once and buy sugar free honey from the store instead of ordering xylitol honey. The result was a plastic looking, plastic tasting cookie. You must use both almond flour and coconut flour. 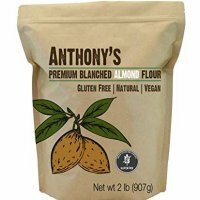 If you only have one flour or the other, don’t assume you can substitute all coconut flour for the almond flour or vice versa. You’ll have either goop or hockey pucks if you do. Xylitol can be harmful to dogs. Use caution when using around your four legged friends! Healthy gluten free chocolate chip cookies made from scratch. These easy gluten free cookies are soft, gooey, and made without xanthan gum. It's truly the perfect GF chocolate chip cookie. Add the first eight ingredients and mix well. Fold in the chocolate chips and/or nuts. Drop by rounded teaspoonfuls on a lightly greased cookie sheet. Bake 15-17 minutes or until slightly brown. Remove from oven and let cool. Once they've set slightly, remove to rack to finish cooling. Do not double this recipe! This recipe only works with xylitol honey or xylitol maple syrup. My experience with sugar free honey resulted in a plastic looking, plastic tasting cookie. 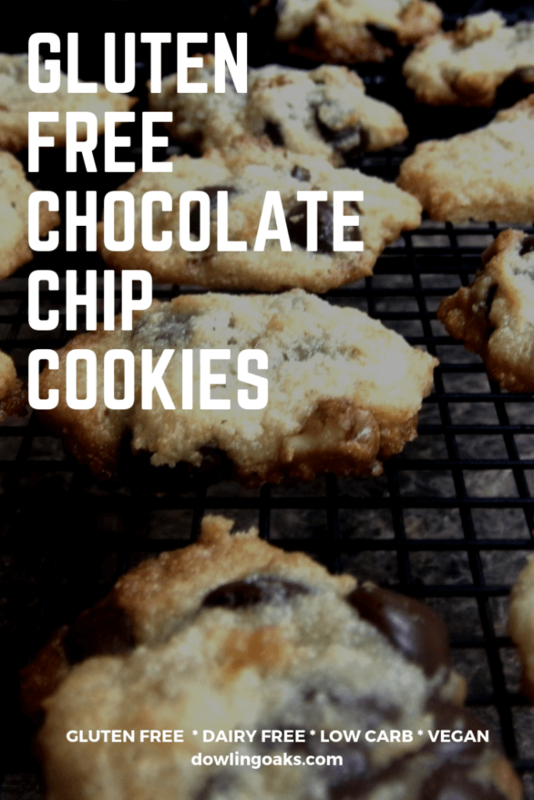 Looking for Gluten Free Chocolate Chip Cookies Without Xanthan Gum? I’ve never done a lot of cooking with xanthan gum. 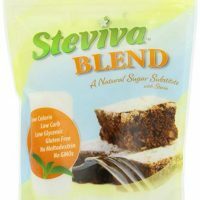 I’m not against using it, it was just an ingredient I couldn’t find when I first started baking gluten free so I didn’t use them in my recipes. Since then I’ve realized a lot of people can’t digest xanthan gum well, but have problems finding GF recipes without it.